3. Display - 5.8" (S8) and 6.2" (S8+) Super AMOLED panels, APL, brightness, contrast, color temperature, sRGB coverage, etc. 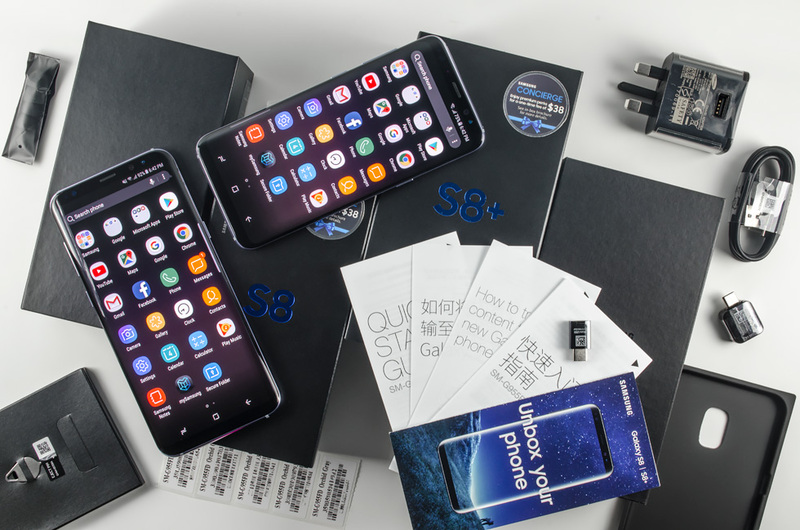 We suppose that in most of the news, hands-on overviews, reviews and other references to the Samsung Galaxy S8 and Galaxy S8+, the general opinion is similar to "These are great phones". In this review, we try to compare both models and provide the most detailed tests and measurements where possible as well as an unbiased overview on the two devices to check whether they live up to expectations. We are reviewing Exynos 8895-based S8 and S8+, both in their DUOS variant - with a hybrid, dual-SIM card slot. Samsung Galaxy S8 and Galaxy S8+ differ only in dimensions, weight, display size, pixel density, and battery capacity. The rest of the specifications of the two models are identical. The S8 has a 5.8-inch display with a pixel density of 570 ppi and a 3000 mAh battery. The S8+ is equipped with a 6.2-inch display with a pixel density of 529 ppi and a 3500 mAh battery. Both have a Super AMOLED panel with a WQHD+ resolution (1440 x 2960) and aspect ratio of 18.5:9. In terms of performance, both models are available either with a Qualcomm Snapdragon 835 MSM8998 chipset or an Exynos 9 Series 8895 one. The Snapdragon 835 SoC packs 4x 2.35GHz and 4x 1.9GHz Kryo cores along with a 710MHz Adreno 540 GPU. The Exynos 8895 SoC features 4x 2.3GHz Exynos M2 Mongoose cores and 4x 1.7GHz Cortex-A53 CPU cores along with a 550MHz 20-core Mali-G71 MP20 GPU. Either way, the chipset is coupled with 4/6GB of LPDDRX RAM, double-channel, clocked at 1833MHz, and 64/128GB of UFS 2.1 storage. The latter can be expanded with up to 256GB. As long as it concerns the camera department, the two models have variants, too. They either pack a 12.2MP Sony IMX333 Exmor RS primary shooter and an 8MP Sony IMX320 Exmor RS one or a 12.2MP Samsung S5K2L2 ISOCELL rear camera and an 8MP Samsung S5K3H1 front one. Optical image stabilisation, Phase detection with Dual Pixel, Object tracking AF, 4K video recording, LED flash are on board as well. The advanced chipsets offer the latest in connectivity. With either SoC the S8 and S8+ support dual-band Wi-Fi 802.11 a/b/g/n/ac with VHT80 MU-MIMO, 1024-QAM, Wi-Fi Hotspot, Wi-Fi Direct, Cast display, Bluetooth 5.0, NFC with Samsung Pay, ANT+. The models have single-SIM and dual-SIM versions, dubbed DUOS. Each supports 2G GSM (800, 900, 1800, 1900 MHz), 3G UMTS (850, 900, 1700/2100, 1900, 2100 MHz), 4G LTE-FDD (700 Class 13, 700 Class 17, 800, 900, 1700/2100, 1800, 1900, 2100, 2600 MHz), and 4G LTE-TDD (1900, 2300, 2500, 2600, 700 MHz). LTE speeds are Cat. 16 ones. The smartphones support all available satellite positioning systems, including GPS, GLONASS, BeiDou, and Galileo. The support for the last two is limited according to the market. There are a 3.5 mm jack and a USB Type-C 3.1 port with OTG support. The S8 and S8+ run deeply customised Android 7.0 Nougat with Samsung Experience 8.1 on board. They are also the first Samsung smartphones with the company's AI service, called Bixby. For complete details, here are the full Galaxy S8 Exynos and Galaxy S8+ Exynos specifications. 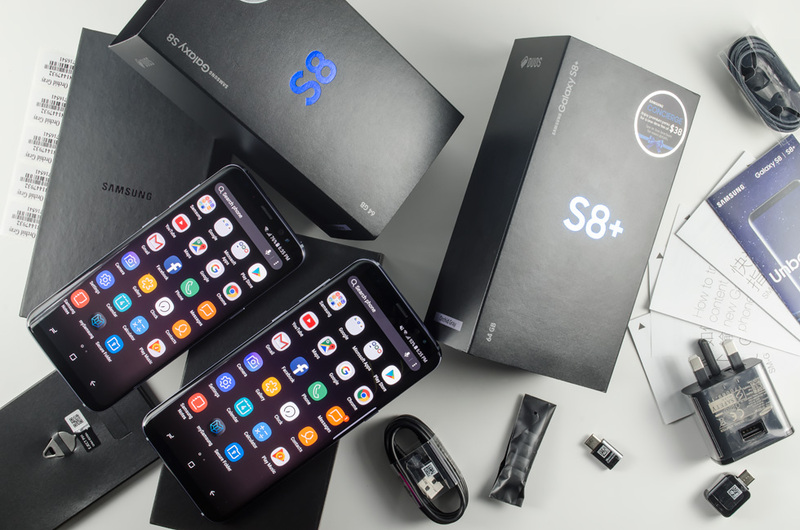 The Galaxy S8 and S8+ arrive in identical boxes in graphite black colour. Each box resides in a "sleeve" of the same colour with the model's name imprinted in its centre in dark blue colour. The full model name, storage and SIM card version are imprinted as well. The lid of the box has the Samsung logo in deep black and with a different texture. It opens on the right side and unfolds to the left unveiling the contents. The devices are placed in a top-level compartment with all standard protective packaging. Below them, you will see an envelope with the standard documentation (quick start guide and a Smart Switch leaflet) and a SIM tray pin. When the envelope is removed, it unveils the rest of the contents: AKG-tuned earphones with spare pads, USB Type-C cable, charging adapter, USB Connector (C to A), and a Micro USB Connector (C to B). Both of our review units arrived with a British Standard (BS 1363), 13 amp charger that has 3 pins and supports 220-240 V electric systems. This type is used in the United Kingdom, Ireland, Malta, Malaysia, and Singapore. Prepare a plug adapter, if you live elsewhere and receive a device with such a charger.